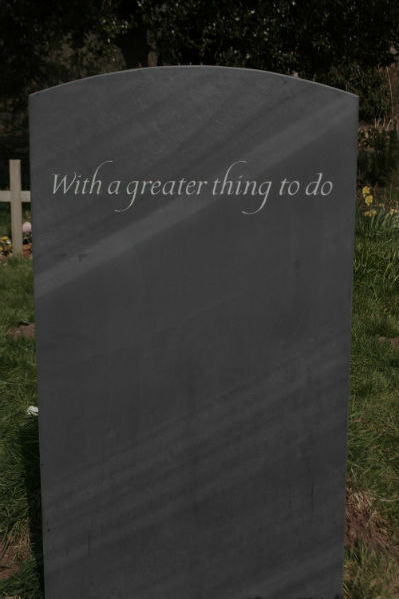 1) "Less is more" - epitaphs are usually short and concise. 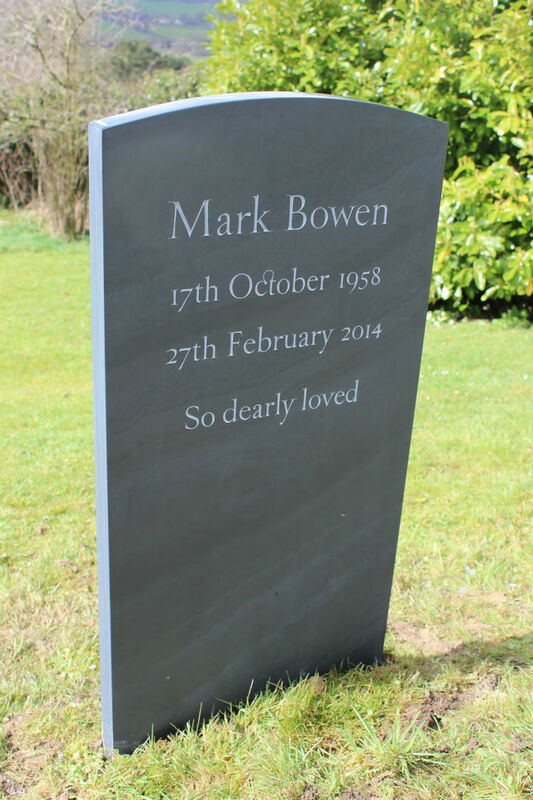 Even if you use the whole reverse of a headstone, you will be limited to a few lines. They are a chance to sum up a person's life in just a few words, to give it shape and express real emotion. 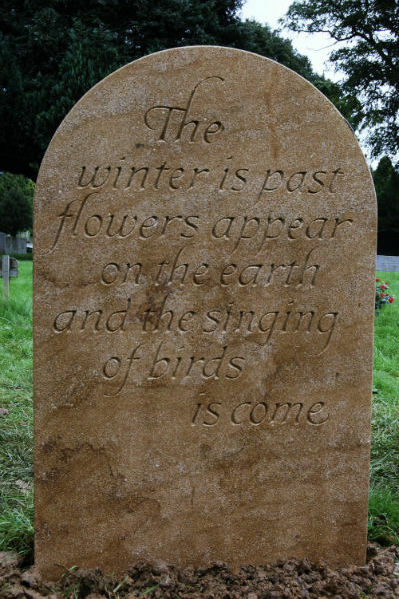 2) Epitaphs often convey a strong feeling. 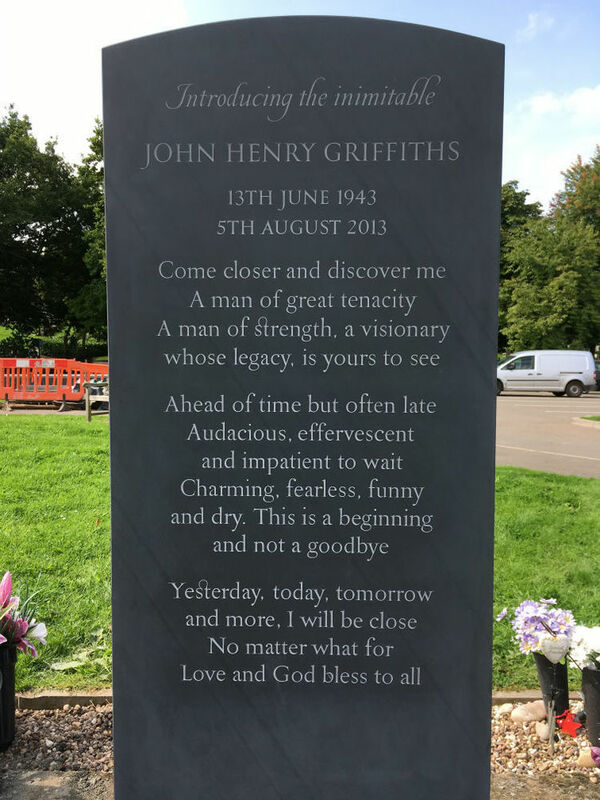 However, the best epitaphs are timeless and not overly sentimental, and for this reason, I always advise waiting at least a year before choosing so that emotions have time to settle and you don't later regret your choice. 3) Often, someone is speaking in the first person (a relative, a friend; the deceased). You might want to think about whose voice you want this to be. 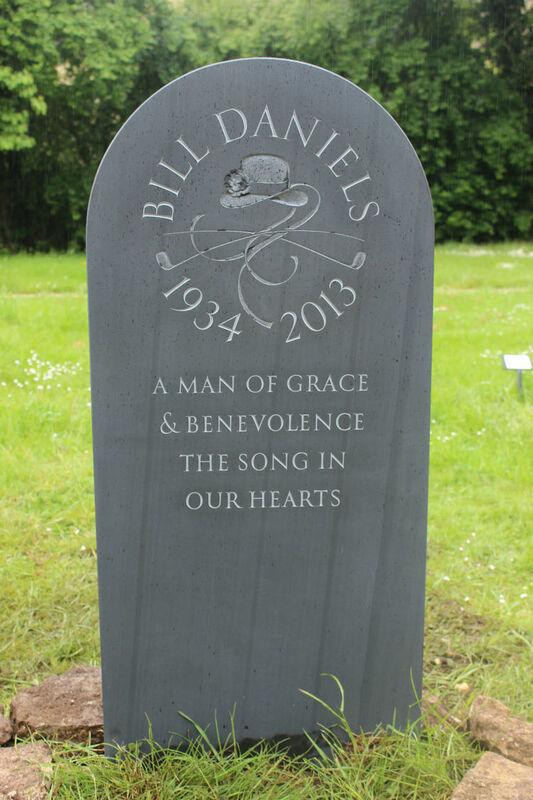 4) Consider whether you want the epitaphs to speak directly to someone. This may be a passerby or the loved one themselves. 5) Take inspiration from literature, lyrics and poems. You might even use a few words from a poem which was read at the funeral. 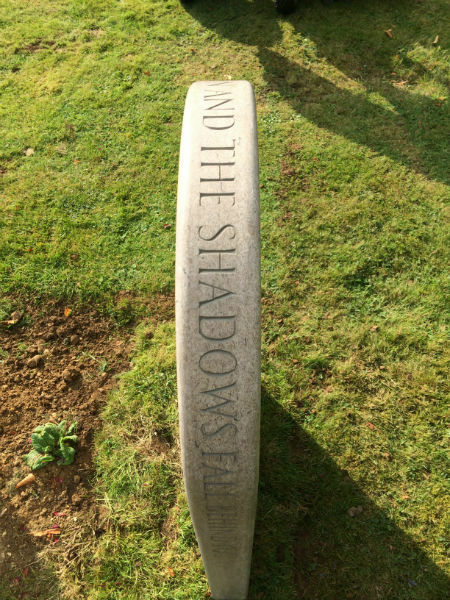 The headstone epitaph often includes a person's name and dates together with a headstone inscription. This may take the form of a piece of prose or a reference from the Bible. The aim is often to praise the humble virtues of the person who has died or to remind us of the bond between the living and the dead. It may be a symbol or reminder of our mortality or indeed immortality. This is a very personal choice, one that should not be influenced by others. Below is a list of headstone inscriptions and memorial quotes. I began with 150 but I keep adding more! Many of my favourites are ones that clients have made up themselves or have found in poems or even lyrics to songs. 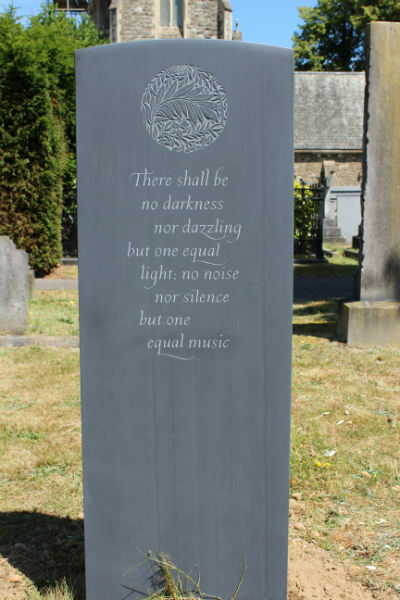 For example, I recently saw an epitaph on a headstone saying "Give me the beat boys and free my soul", a lyric from a song by Mentor Williams. The most important thing to bear in mind I think, is that the inscription will be there for hundreds of years. Do not be hurried into choosing an epitaph straight away. 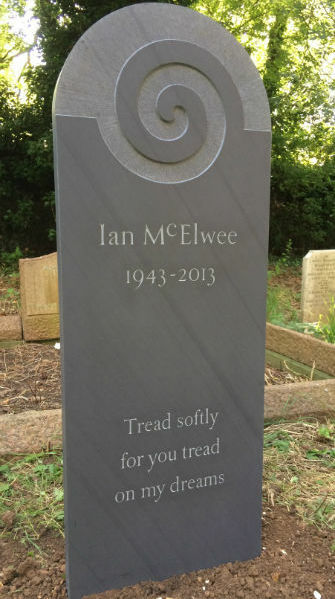 I always encourage people to wait at least a year before choosing a headstone. 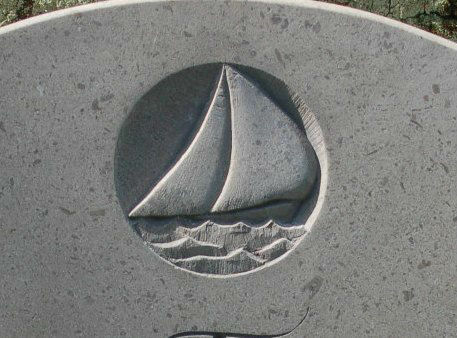 For examples of carvings you might also include see this post on headstone symbols. You may also want to look at my list of beautiful funeral poems for inspiration. 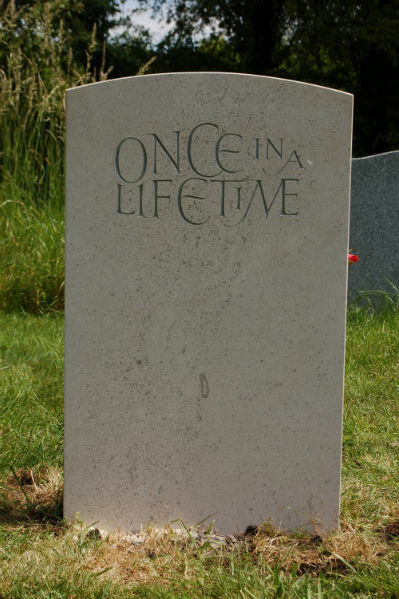 In many cases the simplest headstone epitaphs or inscriptions can be the most profound. We remember..... with open hearts. Our love is love forever. You are always in my head. Our brief partings on Earth will appear one day as nothing beside the joy of eternity together. Grace to be born and live as variously as possible. Step softly, a dream lies buried here. 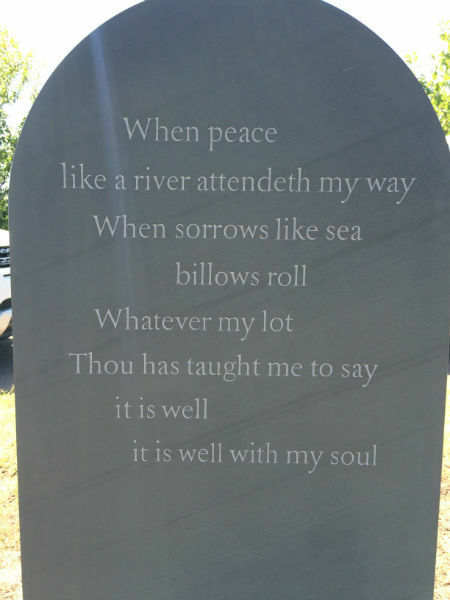 (Yates) See these words on a headstone. Your calm is in the trees. The sun on my face, even on the shortest day. Be sure, wherever I may roam, my heart is with your heart at home. Death is only a shadow across the path to heaven. Sweet are the memories that never fade. His life a beautiful memory, his absence a silent grief. There was grace in her steps, love in every gesture. She touched everyone with special love and kindness. Lost now but loved forever. A star on Earth and a star in heaven. An angel on Earth and an angel in heaven. He longest lives, who most to others gives, himself forgetting. Her works were kindness, her deeds were love. I will dwell in the house of the Lord forever. I know I am deathless. cannot be swept by a carpenter’s compass. from what anyone supposed...and luckier. How many times do I love thee, dear? They loved each other and taught us that love. Peace is thine, and sweet remembrance is ours. Whither tho goest I will go. And think: she wanted storms. Life is not about waiting for the storm to pass…. it's about learning how to dance in the rain. The kingdom of Heaven is within you. To reach a great height a person needs to have great depth. Heaven lies about us in our infancy. I used to measure the skies, now I measure the shadows of Earth. She filled every second of her life with laughter, love and happiness. Their greatest peace was found in nature. Life is not about waiting for the storm to pass…. it’s about learning how to dance in the rain. She is not far away. Gently I gather and treasure them all. So missed, so loved, so very dear. God could not have made earthly ties so strong to break them in eternity. Too well loved to be ever forgotten. May she be remembered as she remembered others. Many of the epitaphs above would be suitable for a child, but here are a few special ones for a child. I encourage parents to try to write their own epitaphs or to search for inspiration in poetry and lyrics. Below is an example of a song by Alvin and the Chipmonks, which has several lines you could use on a headstone for a child. I have also created a separate list of epitaphs and ideas for children's headstones. Called by one who loves him dearly. Held for a moment, loved for a lifetime. Budded on Earth to bloom in Heaven. May you find comfort in the Arms of An Angel. I held you your whole life. There is no foot so small that it cannot leave an imprint on this world. Born into the arms of the Angels. If every tear we shed for you became a star above, you'd stroll in Angels' garden lit by everlasting love. Tread carefully, here lies our world. Gently by... isn't it grand? As snug as a bug in a rug. Gone to be an angel. Each new life... No matter how fragile or brief... Forever changes the world. So small, so sweet, so soon. A little soul takes wings. Sometimes love is for a lifetime. Sometimes a moment is a lifetime. Ours for a little while. Visit my gallery of children's headstones for more inspiration. In the blest kingdoms meek of joy and love. To know him was to love him. On the hearts he left at home. I would hurry to my place of shelter, far from the tempest and the storm. Guarantees them not to any. Since nothing is for always yours. In sure and certain hope. On to the land of promise, to eternal life. They are unquenchable, they only sleep. A man who built bridges. A gentle man and A gentleman. One of God’s good men. there rests a hand other than mine. And so when I remember you I think of all things rich and true. A fine man who made a difference to so many. He gave us the meaning of humanity. A true individual is never forgotten. Who loved this place together with his darling. Lived life to the full. Loving, loyal and full of laughter. Thou dost keep him in perfect peace whose mind is stayed on thee. He dwells in a beautiful garden, beneath God's heavenly skies. Where the one we love is sleeping and will never be forgot. Requiem aeternam dona eis, Domine– "Grant them eternal rest, O Lord"
Visit this blog post for another 200 epitaphs and further advice. 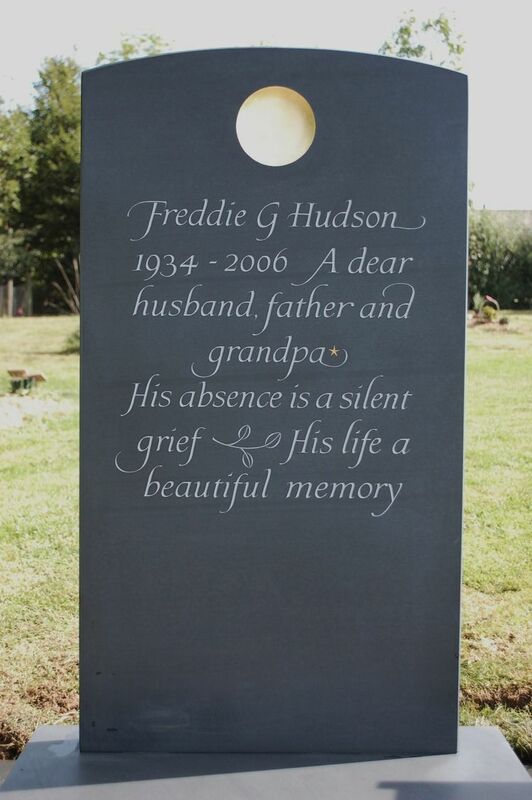 Please visit my gallery of headstones for more inspiration.